This striking desig nof the tiara, which belonged to the tobacco heiress Doris Duke, was worn flat on the sleek short hair and with the long earrings fashionabele in dhe 1920s. The laurel wreath, acanthus and garland motifs were traditional types of tiaras, however, contemporary jewelers invented new styles to rejuvenate headpieces and jewelry. 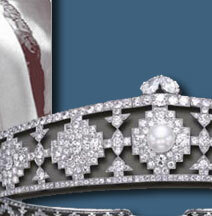 This tiara was purchased by either Nanaline or James B. Duke in 1924 and is an excellent example of the early Art Deco tiara. Designed to sit low on the forehead, rather than on the top of the head, this was the perfect look for the cropped boy's hairstyle favored at the time. The bandeau, with a geometric all-white diamond and platinum design, would have complimented perfectly the long sautoirs and straight and narrow silhouette. 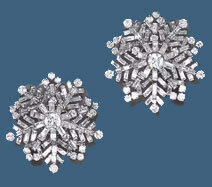 Towards the turn of the last century, new styles of tiaras developed and increased in popularity. At the same time, a newly wealthy class of industrialists were becoming America's aristocracy and began to entertain with the same extravagance of European royalty. The charity ball and numerous private parties were new forms of socializing that gave stylish women an opportunity to wear tiaras outside of the traditional Court functions. This tiara was purchased by either Nanaline or James B. Duke in 1924 and is an excellent example of the early Art Deco tiara. Designed to sit low on the forehead, rather than on the top of the head, this was the perfect look for the cropped boy's hairstyle favored at the time. 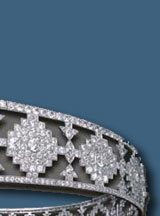 The bandeau, with a geometric all-white diamond and platinum design, would have complimented perfectly the long sautoirs and straight and narrow silhouette. 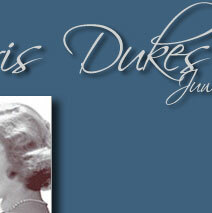 Doris Duke seems to have preferred colored stones, whereas her mother specilized in diamonds. Amazing pink topaz and diamond necklace set. Doris was a platinum blonde and wore pastels well. She was 5'10" tall and spoke in a soft high breathy voice (remember Jackie) perhaps it was an affectation among the wealthy. Doris played pretty swinging jazz piano and loved to jam with the musicians who appeared in the Newport Jazz Festival. 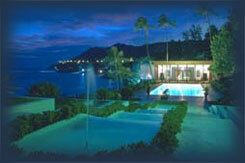 Now that's my idea of Heaven: a mansion on the ocean, gorgeous jewels, a slender figure, and jazz jams through the night!